This year will bring us the Winter Olympics in South Korea, U.S. mid-term elections, and a U.K. royal wedding. Each event will draw a global audience, but tax directors at multinational companies will pay closer attention to other international matters. The new U.S. tax law ( Pub. L. No. 115-97), signed Dec. 22, slashes the country’s corporate tax rate to 21 percent from 35 percent, forcing companies to reassess their balance sheets. 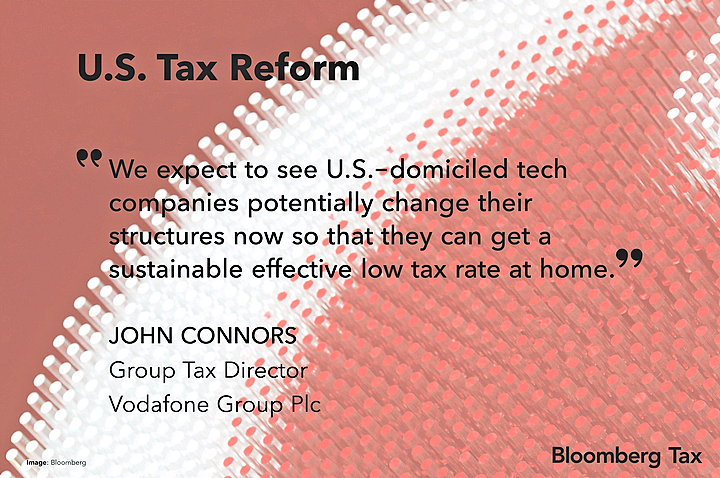 Overall, it will have a “significant” effect by making the U.S. a more attractive place to do business, John Connors, tax director at telecommunications company Vodafone Group Plc, told Bloomberg Tax. Non-U.S. companies active in the country, meanwhile, will spend the first half of 2018 calculating the effect of the new laws, Glyn Fullelove, head of tax at global events and publishing company Informa Plc, told Bloomberg Tax. In the U.K., British American Tobacco Plc, Royal Dutch Shell Plc, and BP Plc have all said in the past two months they will give more detail later this year on how their bottom lines are affected. 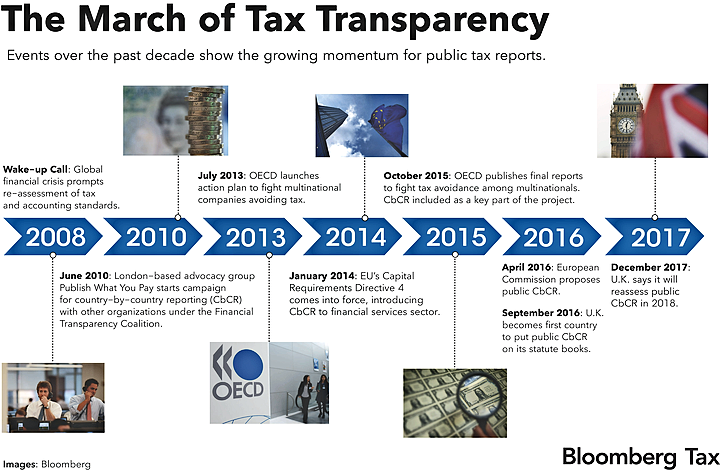 The Organization for Economic Cooperation and Development began an ambitious project in 2013 to re-write tax policy for multinational businesses, aiming to prevent them abusing mismatches in international tax laws to shift profits to offshore havens. Resolving how to tax internet-based businesses is an unfinished part of the 15-action project. In April, though, the OECD will deliver an interim report to the Group of 20 on its re-booted attempt to reconcile the matter amid an increasing number of digitized business operations. The final report will come in 2020. 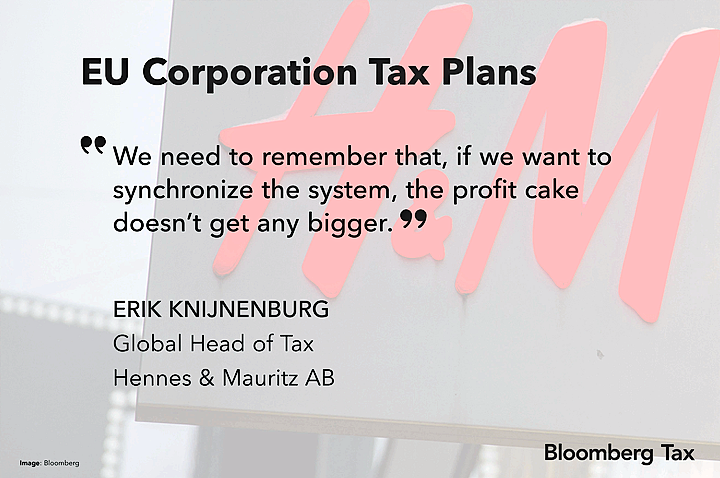 Ahead of the report, the head of tax at Swedish clothing retailer Hennes & Mauritz AB warned on the risk of the OECD hampering companies that have both an online and physical presence. “If you’re targeting just the internet companies, that’s pretty separate” to companies that have an online and physical presence, Erik Knijnenburg told Bloomberg Tax. While U.S.-headquartered multinationals have until the end of this year, more than 40 countries made multinationals based in their jurisdictions file global tax reports by Dec. 31, 2017. Known as country-by-country reporting, the reports are the most widely adopted policy from the BEPS project. The measure aims to provide a clearer picture of companies’ activities for each country in which they operate. Multinationals’ country-by-country reports to the tax authority of their headquarter jurisdiction are currently private. Either through new legislation or data leaks, however, Vodafone’s Connors and H&M’s Knijnenburg are both expecting their companies’ reports will become public. As a result, Vodafone and H&M plan to publish the reports themselves with explanatory notes to aid understanding in 2018. Vodafone began filing annual tax transparency reports in 2013, and Connors told Bloomberg Tax that the Newbury, England-based business wanted to continue leading in this policy area. Vodafone publishing its country-by-country report will strengthen the company’s “critical principle” of trying to build trust in the business, the U.K. tax system, and the wider government, he added. In the past year, countries including Spain and Hungary have either introduced or announced plans to implement real-time tax reporting systems. While the challenge of replacing existing reporting systems slows down the pace of change for some governments, tax directors expect countries across the globe to use more automated reporting in 2018 and beyond. Vodafone’s Connors noted that tax authorities are using digital tax reporting systems more often and cited how they can boost efficiency. Yet early examples of these systems still demand a “very significant amount of manual data handling” for both businesses and tax authorities, he said. For Mariano Giralt, meanwhile, a London-based head of global tax services at The Bank of New York Mellon Corporation, the use of technology in the tax industry goes far beyond reporting systems. The European Union has made news worldwide over its state aid investigations into Apple Inc., McDonald’s Corp. and, most recently, Sweden-based furniture business IKEA. On top of these investigations, tax directors cited the EU’s re-launched plans to harmonize the rules on taxation of multinational companies as a topic they will monitor during 2018. “The outcome of various EU state aid challenges to tax law and administration, and any progress on the proposed Common Consolidated Corporate tax base, will be interesting in terms of the impact on the flexibility and focus of countries’ tax policy in future,” Vodafone’s Connors said. Copyright © 2018 The Bureau of National Affairs, Inc. All Rights Reserved.